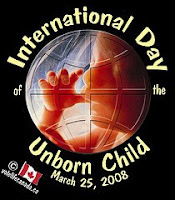 March 25th, 2008 is the International Day of the Unborn Child. It is a day when all people of good will should rededicate themselves to advocate that societies around the world include every unborn child within their understanding of the human community. It is a day for people of faith to pray for the eradication of abortion from the face of the planet. Civilized societies give protection and care to all human life from conception to natural death. Universal human rights include every human life. The first and highest human right is the right to life. It is the first and highest human right because it is foundational to all other human rights. Without the Right to Life guaranteed, all other rights become arbitrary and uncertain. "The child by reason of its physical and mental immaturity needs special safeguards and care, including appropriate legal protection before as well as after birth." But that was then -- this is now. The idea of protecting life before birth has become unfashionable in the years since that Declaration fifty years ago. Humanity has regressed not progressed regarding the most fundamental of human rights. Today, an estimated 40-million abortions occur in the world each year! Abortion is not a right, it is a holocaust of unequalled proportions. True champions of universal human rights must fight for recognition of the sanctity, dignity, equality of all human life, not just some. Let us be reminded that Christ died for all sinners. There is no sin He will not forgive. If you have advocated abortion, stop: Begin to advocate for universal human rights and life affirming alternatives to abortion for women in crisis pregnancies and their babies. If you have had an abortion, understand that God will forgive that too. I know what I am talking about. Thirty-seven years ago, I advocated and pressured my girlfriend to abort our child. She did. Through repentance and confession we were both reconciled to God through faith in Jesus Christ. If you know somebody who is in a crisis pregnancy and considering abortion, HumanLifeMatters can help. There are many Christian crisis pregnancy centers situated across Canada and the United States. They have volunteers who are ready, willing, able and wanting to help their women in crisis pregnancies to make life affirming decisions for themselves and their babies. 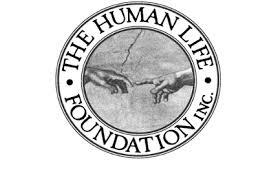 If you know somebody who needs to locate a pregnancy counselling centre, send an email note to HumanLifeMatters@shaw.ca and HLM will put you in contact with a center in your area. Make this International Day of the Unborn Child mark a turning point or time of recommitment to the sanctity, dignity and equality of all human life.